This article covers basics integration of firebase realtime database. The other concepts like performs CRUD operations, data validations, firebase access rules also covered. If you are new to firebase, I suggest you check my other articles about Firebase Auth and Firebase Analytics to improve your knowledge over firebase. Firebase realtime database is a schemaless database in which the data is stored in JSON format. Basically the entire database is a big JSON tree with multiple nodes. So when you plan your database, you need to prepare the json structure in way that the data is accessible in easier way by avoiding nesting of child nodes. Here is an example of storing list of user profiles and posts in json tree. You can go through firebase Structure Your Database guide to learn the best practises while defining the database structure. Firebase provides great support when comes to offline data. It automatically stores the data offline when there is no internet connection. When the device connects to internet, all the data will be pushed to realtime database. However enabling disk persistence stores the data offline even though app restarts. Disk persistence can be enabled by calling below one line code. Here is complete guide about firebase offline capabilities. Before getting into the android app, I would like to give you basic information about performing CRUD operations on to realtime database. Later we’ll combine all these concepts together to build a simple app with firebase realtime database as backend. In order to perform any operation on to database whether it can be read or write, you need to get the reference to database first. The below code gives you reference to database JSON top node. From here you need to use the child node names to traverse further. To insert data, you can use setValue() method on to database reference path. This will create or update the value on path provided. For an example below code inserts a node called “copyright” in json top level. The realtime database accepts multiple data types String, Long, Double, Boolean, Map<String, Object>, List<Object> to store the data. You can also use custom java objects to store the data which is very helpful when storing model class directly in database. Let’s say you want to store user profile in the database. First you need to create User model with an empty constructor and other properties. As every user needs a unique Id, you can generate one by calling push() method which creates an empty node with unique key. Then get the reference to ‘users’ node using child() method. Finally use setValue() method to store the user data. By running the above code, a new user node will be inserted in database with a unique key value. In general, the user id should be acquired by implementing Firebase Auth in your app which gives you authId that acts as user id. To read the data, you need to attach the ValueEventListener() to the database reference. This event will be triggered whenever there is a change in data in realtime. In onDataChange() you can perform the desired operations onto new data. Below is the event listener that is triggered whenever there is a change in user profile data that we created earlier. To update data, you can use the same setValue() method by passing new value. You can also use updateChildren() by passing the path to update data without disturbing other child nodes data. For example if you want to update only the user email, you can use below code block. To delete data, you can simply call removeValue() method on to database reference. You can also pass null to setValue() method which do the same delete operation. You can learn more about performing CRUD operations onto more advanced data like Lists of data here. Firebase rules provides a way to identify user role while performing read and write operations. These rules will acts a security layer on the server before perform any CRUD operation. By default the rules allows user to perform read & write operation only after authentication. The below rules allow authenticated users only to read or write data. Below rules allows everyone to read & write data without authentication. You can also use these rules to validate data before inserting into database. For example below rules validates the name to be less than 50 chars and email to be valid using email regular expression. ".validate": "newData.isString() && newData.val().length < 50"
Go through firebase security & rules guide to learn more about the security concepts. Now we have enough knowledge to get started with an android project. Let’s create one and see how to integrate the realtime database with an example app. 2. Give the package name of your project (mine is info.androidhive.firebase) in which you are going to integrate the Firebase. Here the google-services.json file will be downloaded when you press add app button. 3. 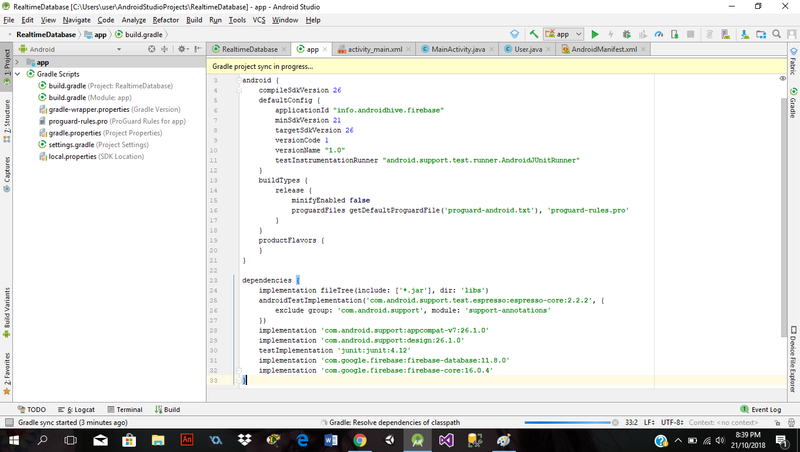 Create a new project in Android Studio from File ⇒ New Project. While filling the project details, use the same package name which you gave in firebase console. In my case I am using same info.androidhive.firebase. 4. Paste the google-services.json file to your project’s app folder. This step is very important as your project won’t build without this file. 5. Now open the build.gradle located in project’s home directory and add google playstore dependency. * Created by Ravi Tamada on 07/10/16. 8. Open the layout file of main activity activity_main.xml and add the below layout. This layout creates a simple form where you can enter the profile data to store in database. 9. Open MainActivity.java and do the below necessary changes. The code is very simple and easily understandable. Our goal is to create the json structure as below in which ‘app_title’ stores the app title. ‘users’ stores user profiles as an array of nodes. > getReference(“app_title”) create a node named app_title which stores the toolbar title. > getReference(“users”) gets reference to users node. > updateUser() method updates user information like name and email. Run & test the app once. You should be able to see the changes in realtime in your firebase console. Check the Demo video that shows how to run and test the app. Unlike Analytics, Cloud Messaging, Crash Reporting and other services, firebase realtime database is not completely free. There are certain limitations in Free plan. You need to pay few bucks for the usage of number of connections, disk usage and network usage. For more information check out the firebase pricing plans. I really wished data presentation on Firebase dashboard are in table format (like Parse.com). JSON presentation isn’t OK especially for much data sets. Am I the only thinking this way? Yeah, but hopefully google might comes with a new UI. It is little tricky designing the JSON structure. Here is a small example of simple chat app. You can get some idea from it. Hi Ravi Thank you for the Tuts they are are amazing. I have one question though, how do I create relationships between JSON Objects. In SQL we archive that via foreign keys, so whats the JSON format solution? Firebase is suggesting to duplicate the data in order to have the relationship. Check their docs where then gave examples of Chat App. Thanks a ton Ravi. You nearly solved my probelm. You write great tutorials. I refer your tutorials to my juniors as well and it helps them too. Hi Ravi, is that possible to store image / video instead of text using firebase ? Can you please provide some samples to implement 1:1 chat with data structure in firebase? I have came across others samples but they all are for group chat.But I need develop complete one to one chat using firebase. Hi, i got redirected by you from Login tutorial ! well its working as a charm. but i have a small issue. I have combined auth and database into single project. When a user register from my app, user name, mail id and password get stored in database. i successfully pushed data to database. But when a registered user deletes his account and when he creates account with same email id, the old data is not getting updated instead it creates another node. 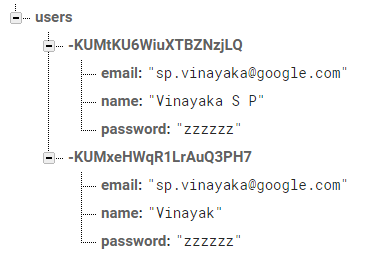 for ex: i registered with email id as sp.vinayaka@google.com. then i removed the account from app and re registered again with same mail id. but node created was new one. Here is how my database looks like. use authId instead of mDatabase.push().getKey(). So that the authId will be same all the time for an user. Nope not yet i’m still searching. Please let me know if you get any solution. I have to directly use authId instead of mDatabase.push().getKey() ? or authId = mDatabase.push().getKey() ? Ravi hello, I guess you are really experienced mobile developer, so I wanna know, how can I retrieve data from Firebase and show it on ListView, can you make simple tutorial or give some advice? hi ravi.. i am getting error as call to undefined method mysqli_stmt::get_result while using in hostinger… what will be the issue because i have used ur php scripts for login and registration in it.. the same scripts are working fine in xampp but in hostinger it is giving error. You are most welcome Marcos. All the best with your development. Hi Ravi… All Your Tutorials Are Very Helpful. I wanna request you to make a tutorial based on caching. For Example If we want to make an app like JUSTDIAL and we want to load all listview data from cache . Can I use Firebase Realtime database to store Images? 11-11 05:42:26.911 11888-11888/ln.uiimagefirebase I/InstantRun: Instant Run Runtime started. 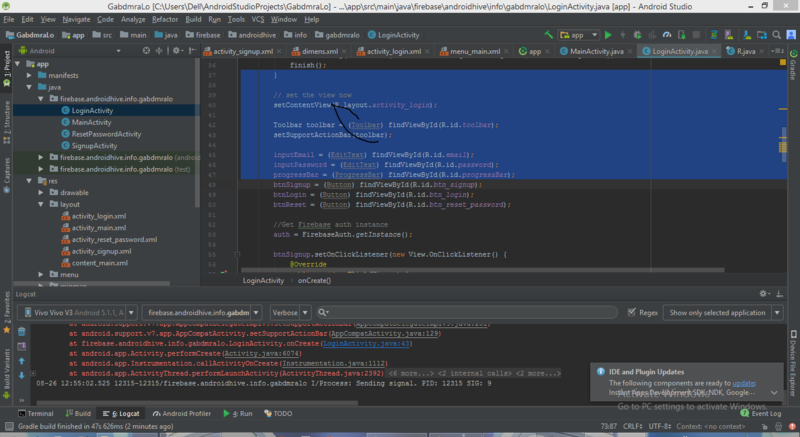 Android package is ln.uiimagefirebase, real application class is null. 11-11 05:42:27.171 11888-11907/ln.uiimagefirebase W/DynamiteModule: Local module descriptor class for com.google.firebase.auth not found. 11-11 05:42:27.189 11888-11907/ln.uiimagefirebase W/DynamiteModule: Local module descriptor class for com.google.firebase.auth not found. 11-11 05:42:27.195 11888-11907/ln.uiimagefirebase W/ResourcesManager: Asset path ‘/system/framework/com.android.media.remotedisplay.jar’ does not exist or contains no resources. 11-11 05:42:27.195 11888-11907/ln.uiimagefirebase W/ResourcesManager: Asset path ‘/system/framework/com.android.location.provider.jar’ does not exist or contains no resources. 11-11 05:42:32.521 11888-11888/ln.uiimagefirebase W/SettingsInterface: Setting airplane_mode_on has moved from android.provider.Settings.System to android.provider.Settings.Global, returning read-only value. java.lang.IllegalArgumentException: Path must not be empty. Hi there! Thank you for this tutorial, it was helpful. But here is what I’m struggling with: I’ve actually inserted this tutorial material into my simple app where I have a login option. So here is the problem – when I logout and then login again All the data vanishes from the app, while they are still nicely present in firebase. So my question is does anybody know how to fix this? How to make data stay both in firebase and application? And I also noticed that after logout my app doesn’t recognise the user and stores new data to firebase like this is a new user (with different unique key). Thanks ahead, guys! thanks ,it’s really very usefull. hi ravi, thanks for nice post. but, i don’t understand, why we should use an annotation @IgnoreExtraProperties in model ? Thank U very Much brother for all the tutorials. Awesome blog for android developers. I have learnt so many things from your blog. I have one question don’t no how to approach. I want to download and upload images parallel in my app like whats app. How to do that? Hi @ravi8x:disqus Ravi Tamada , Sir kindly help me , I want to parse real time data from thingspeak to my mobile application . Please tell me about this . Hi @ravi8x:disqus , I am doing everything as instructed in firebase docs. I am not able to read as well as write in the database… neither it is showing any king of error… What can be the reason for this ? Have you added correct google-services.json ? Make sure that app is connected for correct firebase app. I change the read and write rule for unauthenticated users too. Really stuck with this … Don’t know what the error is.. !! And one more point I could able to create the authentication system with the same app and it’s working. But database is not connecting… !! Can you paste a sample code that stores a string value to database. can you add the code for retriving data for a specific user? Hi @ravi8x:disqus, Great Turorial helps me a lot to understand firebase. I am new in android as well as in firebase, I need to create a collaborative whitebaord application in android and upon my research I found that firebase is great for such application. Can you please add a small tutorial on how to create collaborative whieboard using firebase in android please? much appriceated. Thanks for the tutorial, Sir, but there is something that bugs me a lot. Whenever I press the Save button, I have to do it twice to be able to save the data, and whenever I do, it always shows an error message, but the data itself gets saved without a notification that the data has been saved to the database. Perhaps I need to do something? 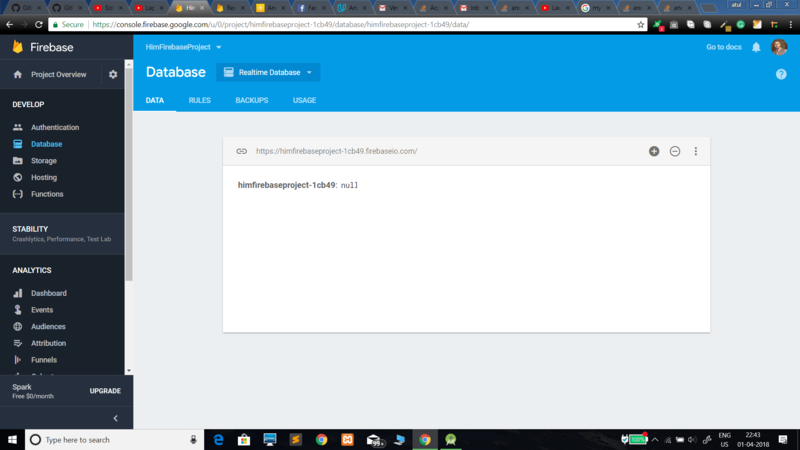 Hi Ravi Tamada, Great Tutorial helps me a lot to understand firebase. I built an app for android which is working fine, now i want to use the same firebase database to ios app. could you share it if know how to do it. Thanks in Advance. I got VerifyError. how can I fix this ? Firebase database is working with Activity.xml file. But if i implement it with only java file , then Firebase Database is not working. Is there any logic behind it or how can we made it working with only java file. Try checking the variables used to store it. I want to know what happen if my app get download by more than 100 users ? You’ll have to pay to continue using the services. Hey , I want to make a app which display the live rates of currency,commodity.So for that i have to pass multiple JSON url. Can you tell me How to parse multiple data in android?? Nice read through related to comprehending Firebase and it serves to be a useful portal for others to be enriched with the knowledge of Firebase and the related topics. Good posting !! Thanks a lot for this tutorial. You have a way of explaining things in a really straightforward way. Very nice and straightforward tutorial. Thanks Sir Ravi ! You need to use Firebase Authentication if you want proper user Id that is being created using firebase user creation. Can I update the chat message after pushing it to fire-base ? I mean if i type hello and send it to firebase and later I want to change it to Hello Ravi , is it possible..
Answering my own post. Yes it is possible..
you are working on movie the marker real time in google map using Fire base. Hi, please i want to kwon how to send notification with an application make in android studio. Thanks Ravi. I like your blog posts. It helps a lot. Just a suggestion, In case someone not getting reference of “DatabaseReference” and “FirebaseDatabase”. I do exact things as you, when I click nothing happen! actually my app doesnt connect to firebase. any help??? Are you there any errors / info in LogCat. Firebase will print useful information. What would be size of your offline data? Thanks, for your tutorial. But, I have fixed my issue by syncing the data in SQlite. Again, thanks for your tutorials. Can i noticed from Firebase database if server has any changes in dataset , if the app is killed by user? SAVE works but UPDATE doesnt work ..
You have to check your security rules. I have one question. I’m used “userId = databaseReference.push().getKey();” in one activity. I want to use the same “userId” value in other activity. If I generate “userId = databaseReference.push().getKey();”, then i will get different userId. How can i get the same userId. Because I’m used security rules to access only authorized user. If I get same userId, then i can get data from database easily from any device which installed my application. You need to enable authentication to get real useId which is consistent across the application. Hii, thank you for your tutorial, you save my grade. I have a question, how can I specify the uid when i add a new user to my database? in your tutorial the uid is generate automatically but i wanna set this for my users. Usually the uid should be fetched by adding Firebase Authentication. When Firebase Authentication is integrated, it provides unique uid for every user. You said, “In general, the user id should be acquired by implementing Firebase Auth in your app which gives you authId that acts as user id”. How can one obtain this authId ? Follow this article to integrate Firebase auth. Once integrated you can get user Id by accessing user object. user is registered but in real time database it is empty ? I have created a new project just to check that if same problem occurs in my new project but in my new project values are stored in database. I am quite confused whats the problem first user was not registered so i have to create a new project and now this problem. I cant create new project for all new tasks. You might be checking in the wrong section. If you are looking for users came from firebase authentication, check the Authentication menu instead of Database on the left side. In Authentication user is registered with unique id but… now i want to store some values while user register like name etc. but the values are not registered in database. and to check this i have copy this exact code in another project and in that values are stored in database. After creating the HashMap, are you storing the data in to mDatabase. I can’t see the code here. What about authentication rules on the dashboard? sorry, What authentication rules ? Check 4. Security & Rules in the same article. Try keeping the rules to below. yes i am following these rules. actually the same code store values in another project. Ok. Debug well. I can’t think of any possible error now. I have tried that to. Well, I don’t have any authentication process as of now. its just a testing app to perform CRUD. hi, i want to develop news app, every news have multiple paragraphs and images. i want to store images in storage not like base64, so how can i link images with database? can i insert large text? Once the firebase storage is integrated, you will get the uploaded image url. The URL can be stored along with news node. You can see the sample code of image upload here. hi, I want to check whether a user is registered in firebase realtime database with his phone number.. how can i go with it ? how I can wait for firebase async retrive data in android? Hi, I have made an android app which uses event data. I am able to add them via the accompanying website, but I can’t figure out how to pull them back down from firebase Real-time DB. Any help is much apprecated? Hey the data isn’t inserting instead it is telling me to change the String to EditText. So What should I do? You can find the errors in LogCat. This way nobody knows what is error is. 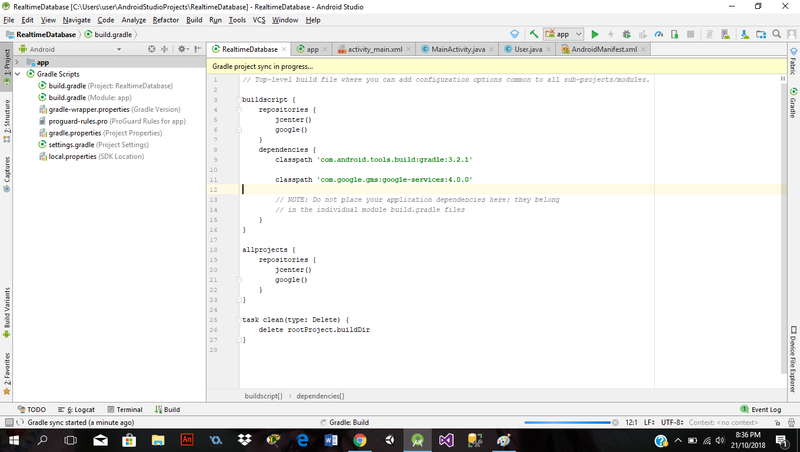 Open LogCat in Android Studio and click on button. When app crashes, it will print an error in LogCat. Do you know Firebase UI project? Can you get the list of users in the database without using ValueEventListener? From my understanding, ValueEventListener only get fired when the database data changes but what if you just want to retrieve whats there? @ravi8x:disqus Can Firebase go hand in hand with Retrofit? Hello..nice article 🙂 Will firebase realtime database works only with the android emulator or does it work on real device upon installation? I have created the the list view using firebase by clicking on it . It open another activity but I want to retrieve different data for each of the activity when I click on list view from firebase. Just one question if i enter a name and email. I am able to read the name and email from the application. Is there a way to keep fetching these data’s? so the user can see the email? See there will be option to enable offline storage. again next day when user sign in, total score retreive from firebase database and show on activity page above both buttons. i try to run and build apk your source code that shown you in above . everything is fine, but when i open it in real phone the application has crash . btw i do some changes in gradle . sorry for my english. How can we use fire base for getting real time data that is how to get the updated news all the time.